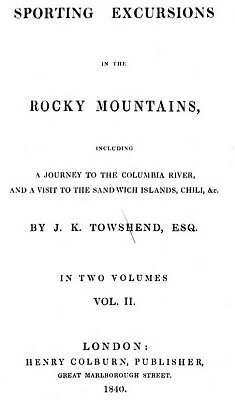 John K. Townsend : Aquatic Hawaiians, 1840.
including a journey to the Columbia River and a visit to the Sandwich Islands, Chili, &c.
the town of Honoruru — Captain William S. Hinckley and P. A. Brinsmade, Esq. Our anchor was soon weighed, and with a fine, free wind, we rounded Diamond hill, and passed along a beautiful indentation in the shore, called Waititi bay, within sight of a large coral reef, by which the whole island is surrounded. We very soon came in view of the lovely sylvan looking village of Honoruru. The shore below the town from Waititi, to a considerable distance above, is fringed with graceful cocoa-nut trees, with here and there a pretty little grass cottage, reposing under their shade. As we approached the harbour, these cottages became more numerous, until at last they appeared thickly grouped together with occasionally a pretty garden dividing them. On nearing the shore, we observed some scores of curiously formed canoes, with large outriggers, which had just put off, and were bound out on a fishing excursion. A number of these passed close to our vessel, and usually paused when opposite, that the denuded mariners might have an opportunity of surveying the strangers, and of bidding them welcome to their shores, by a loud and gay Aroha. Near the bnd a number of natives, of both sexes, were swimming and playing in the surf, and diving to the bottom searching for echinoe and sea weeds, remaining under the water for a considerable time, while their heels were seen moving to and fro, above the surface. 20th — We expected to have left the island several days ago, but the Avon has not returned, and she would not now be able to come, in consequence of a steady S. W. wind which has prevailed for the last week. Our ammunition, and materials for the preparation of birds, are entirely exhausted, and we cannot obtain a fresh supply, so we amuse ourselves in collecting shells on the beaches, plants, fish, &c.
We are living very comfortable in the house furnished us by the king, and we have become completely domesticated in the agreeable family of Mr. Gulick. accompanied by a troop of boys and girls, and sometimes men and women, often to the number of twenty or thirty. us, being compensated for earh one that they bring us, with pins or needles. In their habits they are perfectly amphibious, diving into the sea, and through the dashing surf without the least hesitation, and exploring the bottom for an almost incredible time without rising to breathe. substance called beche la mer. Both these animals are eaten by them as they are taken living from the water ; the spines of the former are knocked off against the rocks, and the soft contents of the case sucked out; the latter, after having the tough outside skin removed, are eaten like biscuits to qualify the meal. There is also another sea animal which is considered by the natives a great delicacy, the sepia or cuttle fish. This is a large, ill-looking creature, with an oval body, and eight or ten long arms or tantacula within the cavity of the thorax is a sack, containing a fluid resembling ink, and as the teeth are sunk into this. the black juice squirts into the face of the masticator, while the long feelers are twisting about his head like serpents. On the 26th of March, we embarked on board the brig, May Dacre, upon our return to the Columbia. from the excellent friends who had treated rae with such uniform kindness and hospitality. We have had an accession to our crew of thirty Sandwich Islanders, who are to be engaged in the salmon fishery on the Columbia, and six of these have been allowed the unusual privilege of taking their wives with them. Some six or eight natives, of both sexes, friends and relatives of the crew, came on board when we weighed anchor, and their parting words were prolonged until the brig cleared the reef, and her sails had filled with the fresh trade wind. They thought it then time to withdraw, and putting their noses together after their fashion, they bade their friends an affectionate farewell, and without hesitation dashed into the sea, and made directly for shore. I thought of blue sharks, and tiger sharks, and shovel-noses, and would not have run such a risk for all the wealth of the islands. and a visit to the Sandwich Islands, Chili, &c.
Geoff Cater (2013) : John K. Townsend : Aquatic Hawaiians, 1840.